Limited Edition World Series Red Sox Baseball Ready for Release! In addition to the World Series Commemorative Boston Red Sox Limited Edition artwork, we are now happy to announce that Charles Fazzino has also created a limited edition, hand-painted baseball celebrating the victory as well. 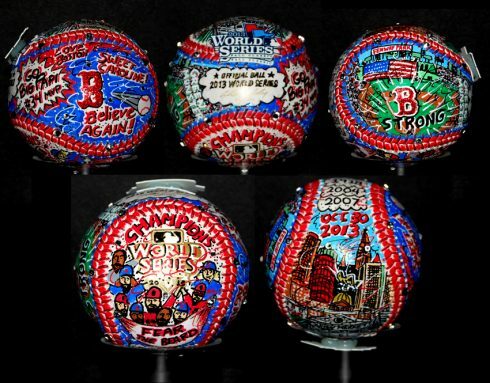 Painted on the Official MLB World Series Baseball, the set will be signed and numbered out of a limited edition of 109 (for the 109th World Series) Each original baseball comes with a beautiful display case and will be made to order. Contact your favorite authorized Fazzino gallery for purchasing information or email us at info@fazzinocollectors.com.